Space officials seek to remedy some of the country’s problems by tackling a massive mission in space that includes the construction of a lunar base; but officials may be better served by addressing the domestic industry’s major shortcomings. Immediately following Russian Prime Minister Dmitry Medvedev’s call for tighter quality control on production in the space industry, the deputy prime minister and head of defense and space programs, Dmitry Rogozin, elaborated on a “super goal”-driven cosmic plan. Back to the moon: When, why and how? No future for Mars exploration? The opinion of the deputy prime minister is somewhat at odds with the position of the administration of Roscosmos (the Russian Federal Space Agency). By speaking on the international competition in space, Dmitry Rogozin contradicted the official opinion of Roscosmos, which has long held that there is no space competition, i.e. no “space race.” Furthermore, with regard to the moon as a potential panacea for Russian problems, there is no precedent in Soviet or modern Russian history for an ambitious super goal that has pulled the economy out of trouble. Nonetheless, the Roscosmos board passed a strategy in early spring for the development of space operations through the year 2030; the plan includes “operating a manned lunar orbital station, maintaining and repairing large spacecraft and orbital transfer vehicles in near-earth orbits.” The document also mentions more ambitious plans, including the creation of a network of research stations on Mars. The strategy requires 150-200 billion rubles ($48-64 million) in investments annually, said the head of Roscosmos, Vladimir Popovkin. According to the document, Russia plans to explore the moon further after 2030. During the first phase of Roscosmos’ strategy, which begins in 2015, Russia will send Luna-Resurs and Luna-Glob orbiters to explore the moon. One of these orbiters will explore the moon’s southern pole, where it will pitch a Russian landing probe and an Indian mini-rover. Beginning in 2020, in the second phase of the plan, Lunokhod-3 and Lunokhod-4 lunar rovers will begin work on the moon’s surface. These rovers, though much smaller than their old Soviet counterparts, are expected to operate for up to five years and within a 30-kilometer range of the landing area. In 2023, a reentry module will land near the Lunokhod-3 and Lunokhod-4 rovers, carrying a return rocket that will bring six or seven capsules back to Earth with moon material. The rovers and landing station left on the moon will serve as the initial infrastructure for a moon facility, paving the way for the future development of a Russian lunar base on that site. 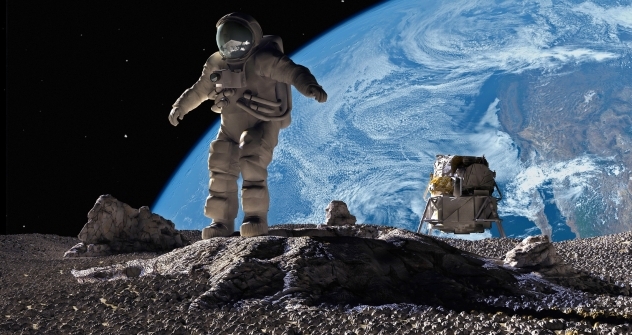 The lunar question has always been on the agenda for Russian space officials. Yet, these are very ambitious plans that, as of now, have neither the material nor the technical foundations to be implemented. Consequently, Roscosmos officials were forced to make an abrupt turnaround in early July. A Russian manned mission to the moon will now only be possible if the presence of water is confirmed there, Popovkin told reporters. He admitted that human presence on the moon is necessary for such research activities, but failed to elaborate on previously announced plans to land astronauts on the moon. Igor Lisov, a columnist for leading industry magazine Novosti kosmonavtiki (“Space Exploration News”) believes the idea of a manned mission to the moon is completely unjustified. “The problems associated with manned space missions are obvious. It’s not a good idea to have a human presence in space right now,” Lisov told the Swiss newspaper Le Temps. According to Igor Marinin, editor-in-chief of Novosti kosmonavtiki, Roscosmos’ budget would have to triple in order to build an orbital base and increase six times to establish a long-term station. An extended meeting with Prime Minister Medvedev, which took place the day before Rogozin announced his plans, only addressed ways to overcome obstacles with Russia’s domestic space industry. Recent accidents, worn-out equipment, staff shortages, the inefficient production management system and the serious lack of an entire range of spacecraft are just some of the tasks that need to be addressed right away. So far, exactly how the super goal and a new space race will help minimize the failure rate, renew equipment stocks and create new satellite constellations can only be speculated.